Marian Anderson’s April 9, 1939 historic concert on the steps of the Lincoln Memorial to a crowd of 75,000 people was prompted when she was not allowed to sing in DAR Constitution Hall. Many know the story and it is regularly brought up on the anniversary. Some may ask, “It was so long ago, why bring it up again?” but as an organization dedicated to historic preservation, it is important to reflect on significant moments in our nation’s history even when they are difficult for us to discuss. Marian Anderson was not allowed to sing in DAR Constitution Hall because of a policy at that time allowing only white artists to perform in the auditorium. The original date requested for her concert, April 9, was already booked by the National Symphony Orchestra, however, a “white artists only” policy was in place and was applied when subsequent dates requested by the promoters were also denied. While the DAR Constitution Hall policy was not mandated by law, the culture of segregation was evident throughout Washington, D.C., and many other parts of the United States during this time. 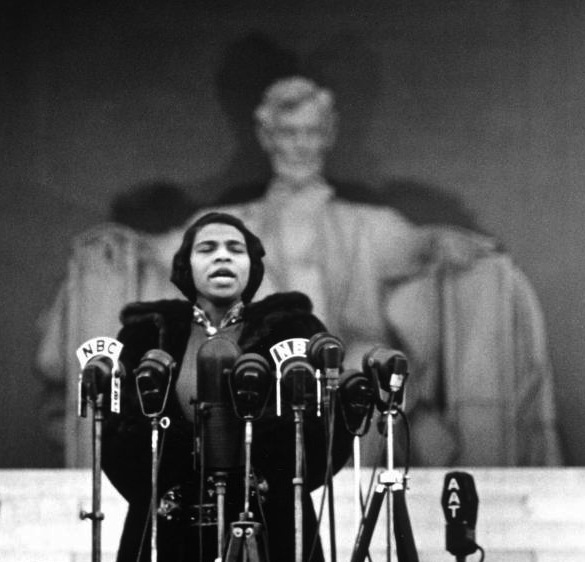 The events and publicity surrounding Marian Anderson’s concert at the Lincoln Memorial helped to highlight existing segregation issues underlying society. In 1939, they had yet to develop into the Civil Rights Movement, which took place almost 25 years later. Marian Anderson is often regarded as a pioneer in the fight for racial equality. She helped bring about change throughout the country and within our National Society as well. A recent acquisition of new historical materials to the NSDAR Archives facilitated the initiation of this new archival project. Sarah Robert, who served as the DAR President General from 1938-1941, kept an abundance of her personal and professional papers. This extensive collection was recently donated to the DAR by Mrs. Robert’s son. It was discovered that Mrs. Robert saved many significant documents related to the 1939 controversy. This unique material provides a glimpse into the opinions and issues that made the 1939 events so pivotal. It is difficult to interpret history without the context of society as events unfold. These papers provide additional complexity and nuance to the story. As new primary source documents are found, it is vital to bring them to light. Our goal is to create a lasting educational resource that can contribute to the ongoing preservation and study of the events and attitudes surrounding this time in our nation’s history. The DAR will never be able to change the role it played in the story of Marian Anderson’s Lincoln Memorial concert. However, we find ourselves continually grateful for the opportunity these events created for our organization to change and grow, as it also helped the nation address important issues related to racial discrimination and segregation. As an organization committed to historic preservation, education and patriotism, the DAR has a responsibility to contribute to the preservation, stewardship and education of Marian Anderson’s legacy. We will develop an educational resource that complements and expands upon other historical research material related to the 1939 concert. I know that there are members who are sometimes confused by differing stories they have heard about the role of the DAR in this history. Misinformation and misunderstanding exists even within our organization. Details have not always been fully clarified, leading to confusion. In order to help members understand more of the details of the history directly from our own historic DAR documents, we have created a small online exhibit that features just a few of the documents we have found in the initial review of the material. We cannot speak to how or why decisions were made by the DAR leadership in 1939 or how information was subsequently communicated to the membership, but we owe it to our members today to help them understand more of the details surrounding the events. A Marian Anderson resources page was created on our DAR Website that list a sampling of materials that explore the history surrounding the events as an educational resource for members and the public. As DAR members it is difficult to hear the story of Marian Anderson’s concert at the Lincoln Memorial and not feel defensive or upset by the role our beloved organization played in that history 80 years ago. It is important for us to own our history for what it was and focus on how our organization has grown into an inclusive group of diverse women making a difference in communities around the world. We can help change the perception of today’s DAR by reinforcing the positive aspects of how our organization acknowledges the history and celebrates the changes the Lincoln Memorial concert set in motion. I encourage you to feel comfortable addressing the Marian Anderson story by learning more on the Marian Anderson section of the DAR Website which includes a downloadable DAR statement, information on her subsequent Constitution Hall performances, educational resources and photos from commemorative events. Please also remember that when others ask you about Marian Anderson and the DAR, you can always direct them to: www.dar.org/MarianAnderson.